A summary of community events that take place annually in Farnham. Farnham has a long tradition of holding annual community events with many of them raising money for local charities. Some events do not have websites but closer to the time, you will find that most organisers advertise the details on our events calendar or send details to the Farnham Herald. Beerex is held at the Farnham Maltings every spring and is the longest-running beer festival to be held in the same place in this country. There are usually around 70 beers available from approximately 30 breweries. All profits are for the benefit of local charities. For full details visit the organiser’s website. The annual Duck Race is held on the River Wey adjacent to Gostrey Meadow. Races are held approximately every 20 minutes. There are also a number of stalls run by local charities. The Duck Race is held on the Saturday of the Bank holiday weekend that falls at the beginning of May. The Fair is held on Spring Bank Holiday Monday on the Recreation Ground in the centre of Rowledge. There are traditional stalls, competitions and games and money is raised for local charities. A traditional fete held in June at Wrecclesham Recreation Ground. Held on the last Saturday in June in Farnham town centre. This annual event is organised by Farnham Lions and the Hedgehogs and has been taking place for several decades. For full details visit the carnival website. 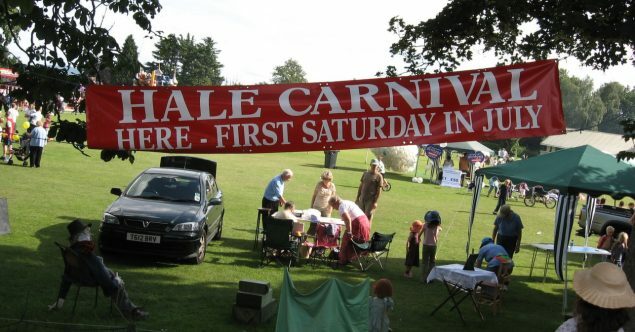 Hale Carnival is held on the first Saturday in July. The carnival parades from Hale School to Hale Recreation Ground. The afternoon fete is a fun combination of live music, food, dance and traditional activities such as the dog show and children’s events. The event is held in July and is organised by Farnham Round Table. The Bourne Show is a traditional village show which is held in July and has taken place on the Bourne Green at Lower Bourne for over 50 years. It provides a great afternoon out for all the family and raises money for local charities and good causes. For full details visit the show website. A free annual event that marks the end of a two week celebration of food. Castle Street is closed to traffic and is transformed into a bustling market place for 80 or so food stalls, live music and food demonstrations. For full details see our Food Festival pages. Farnham is England’s craft town and every October, the town gets involved in a celebration of craft. Craft month provides an opportunity to try out a new craft, to see makers in action, take a craft walk and buy work from local designer makers. For full details visit our Craft Town pages. The annual fireworks display and bonfire is held in Farnham Park. The event is organised by Farnham Round Table on a Saturday around 5 November. An annual dinner that is held at Farnham Castle. The traditional dinner dates back 400 years and was originally held to stop townsfolk from poaching deer from Farnham Park. For full details visit our events calendar. An event for the whole family. The programme is packed full with live music and performances by local schools. Pantomime characters from nearby theatres add to the festivities. More details will be available in the autumn on our events calendar. For more information on these events visit our events calendar which you can filter by fete and fayre.